Popcorn Hour C-200 media player has optional Blu-ray drive | What Hi-Fi? 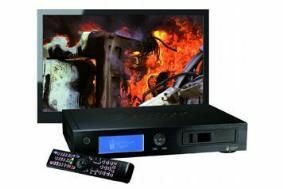 Like the A-110 model it replaces, the C-200 can stream and play all kinds of video and digital media from your PC, storage device, network or the internet directly to your TV. The device will create a central library of all your favourite movie and video files, and can act as a file server to send files over a local area network and the internet. An optional Blu-ray drive turns it into a fully-featured Blu-ray player too. The Popcorn Hour C-200 is available now online for £309 from www.advancedmp3players.co.uk. It's distributed in the UK by Digital Audio Distribution.